Ti Rakau Drive commuters have no doubt noticed Armstrong Motor Group’s latest addition to its flagship dealership – East Auckland Hyundai, which opened its doors to customers last month. It’s owned by Armstrong Motor Group, which also operates 12 other dealerships and represents 19 brands in total across the country. The new dealership is more than 11,000m2, with a 5500m2 square foot of floor space, 21 service bays and seven grooming bays – all equipped with the latest technology, diagnostic equipment and of course, a high-tech coffee machine for customers waiting on vehicles being serviced. The facility’s design reflects Hyundai’s new Global Dealership Space Identity that is currently being rolled out worldwide. This new concept stems from Hyundai’s underlining commitment to delivering greater levels of customer satisfaction and becoming the most-loved automotive brand. This new identity goes further than the traditional car showroom. It combines open space, modern furnishings and the latest technology to deliver an enhanced customer experience. Customer emotion, vehicle motion and the outdoors are concepts that influenced the dealerships visual aesthetic. 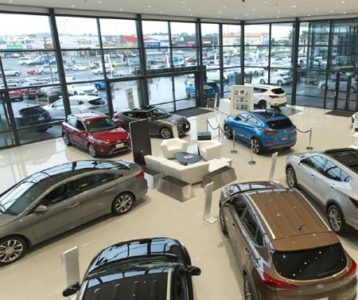 The dealerships warm, bronze exterior tones combined with natural light flows through the interior, resulting in a bright, airy and sophisticated ambience right through into the service bay. The new Ti Rakau Drive dealership is half occupied by Mercedes-Benz Botany which operates with separate sales and service facilities on the left-hand side of the site. Founder and Managing Director of Armstrong Motor Group, Rick Armstrong has high hopes that the brands will act as complementary partners, creating a diversified automotive centre that East Auckland has lacked up until now. 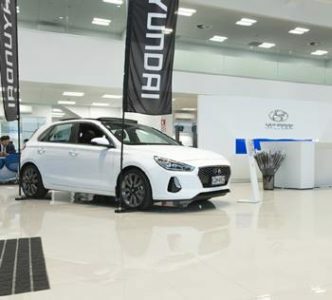 “East Auckland Hyundai is an immaculate new facility that showcases the stylish, high-quality, well-equipped Hyundai vehicles in the new Hyundai line up,” said Armstrong. “It was a long process getting the site to the standard we wanted and we are incredibly happy with the outcome. The dealership is in the centre of one of New Zealand’s fastest growing areas and having Hyundai – a quality high volume brand with a wide range of vehicles will compliment Mercedes-Benz, and is a perfect fit for us,” Armstrong concluded. Combined, the two new dealerships have created over 60 new jobs for the East Auckland region. 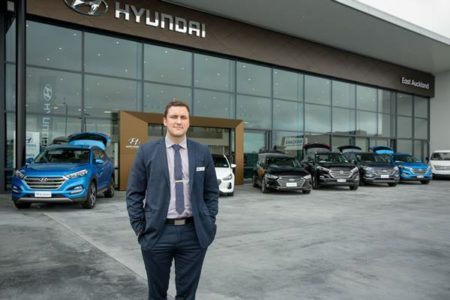 “We’re working on building a reputation for hiring the best people, then delivering exceptional customer service and customer care programs at every touch point,” says James Davy, the new dealer principal for East Auckland Hyundai. James credits the early success of the dealership to a passionate team along with the strength and growing reputation of the Hyundai brand and its commitment to adapting with technology. Utilizing the latest in technical expertise and leading technologies, the service centre technicians at East Auckland Hyundai are factory trained to help maintain and protect the new purchases made from the dealership. By carrying genuine Hyundai-specific parts and accessories, East Auckland Hyundai aims to offer the highest quality and friendly mechanical service at a competitive price for both Hyundai drivers and vehicle owners of other brands alike. Being the newest dealership in the Hyundai network also comes with its advantages. The dealership was the first to make available the new Hyundai i30 to its East Auckland audience and Davy expects to see these opportunities arise more frequently in the future. “Hyundai is coming on strong with stylish, high-value vehicles which we can offer first to our customers, these are also backed by the best warranty in the business,” says Davy. Davy intends to have a strong focus on customer experience and offers competitive pricing on all services including finance options through Hyundai Finance New Zealand. The dealership opened with a finance promotion offering customers the opportunity to own a brand-new Hyundai at 0 per cent interest. “Our customers are at the heart of everything we do, so our new dealer identity has been designed around them. It provides a space for sales and after sales engagement and adds a new dimension – where customers can truly experience the Hyundai brand,” Davy concludes. For the Armstrong Motor Group, this further expands its Auckland footprint with dealerships already in Grey Lynn, Greenlane and Mt Wellington. The two dealerships at 279 Ti Rakau Drive, Botany are by far the largest established by the privately-operated dealership network. With a successful first few weeks for the new dealership and a strong sense of momentum, the future looks bright for East Auckland Hyundai and its team. To check out the great deals on offer from East Auckland Hyundai call 09 272 2010 or head to www.eastaucklandhyundai.co.nz, or pop in and visit James and the team seven days a week.